To unite for mutual benefit those public officials and private persons engaged in the control of arson and kindred crimes. To provide for exchange of technical information and developments. To cooperate with other law enforcement agencies and associations to further fire investigation and the suppression of crime. To encourage high professional standards of conduct among members, and to continually strive to eliminate all factors which interfere with the administration of justice. 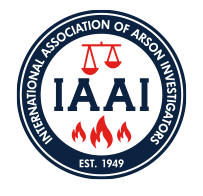 To foster the advancement of the fire investigation profession through the promotion and facilitation of research; and the sponsorship of training, education and professional development." Please contact IAAI Office if you would like a copy of the logo. 410-451-3473.